“Northam Park is Diana’s now. What she intends to do with it is, perhaps, a subject for a later book.” Excerpt from my post Northam Park: Sutton Scarsdale meets Chatsworth Park. Having wrapped up the series on royal weddings, it’s time now to return to my work in progress–Diana’s story. The above-referenced post is an introduction to her country estate and the seat of the earldom which she holds as countess in her own right. Diana’s story is titled Notorious Match. For the next several weeks I shall explore the exterior features of Northam Park’s great house, an English country mansion on the grandest scale. It is a Palladian home inspired by the great Inigo Jones with additions whose designs were wrought by Christopher Wren and Robert Adam. The grounds of Northam Park were established and according to plans laid out by Capability Brown with numerous external features like the ha-ha, the enormous stable block and a Grecian temple. Nor shall we neglect the great house’s interior. Inside are rich decorative plaster work and carved staircases. They favor reason over precedence–the greatest expression of the style we call neo-Classicism. 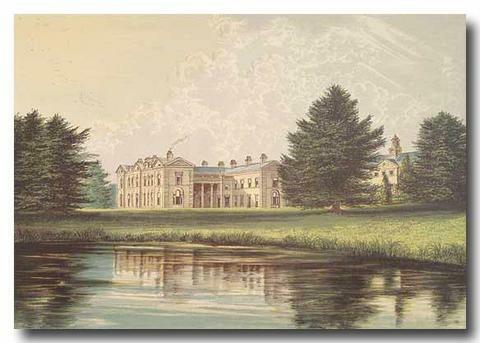 But we shall also see competing Regency styles in other country estates that are in the vicinity of Northam Park. Godley Abbey, for instance, is a Gothic fantasy that Lord Byron had once visited and greatly esteemed. Stansbury Vale is also nearby–a gawky Baroque creation that gives no hint of the beautifully elegant hall it contains. Baroque, as you know, is unrestrained. The celebration of ostentation. This entry was posted in Notorious Match, Regency, Uncategorized and tagged Capability Brown, Christopher Wren, Compton Verny, Godley Abbey, Northam Park, Robert Adam, Stansbury Vale, Wingerworth Hall by Angelyn. Bookmark the permalink. I love that your blog posts are so informative AND that you provide said information with such class and panache. 🙂 And since architecture is something I’m passionate about, I look forward to the next entry – as always, of course. It is your expertise with classical and antiquity mythology that I get so much inspiration from. Thanks for the Hephaestus information. Diana is horrified that her parents have cast her out. You helped me with that!! !